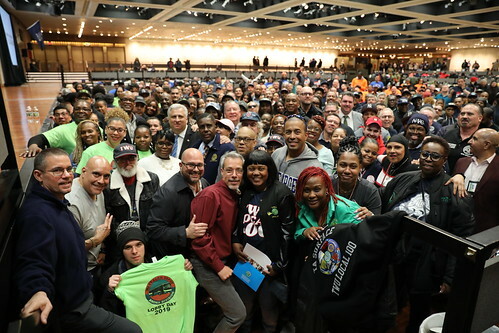 APRIL 9 -- TWU Local 100's annual Lobby Day brought approximately 1,500 transit workers to the State Capital to graphically demonstrate the power of the union. Legislative leaders including Assembly Speaker Carl Heastie, Comptroller Tom DiNapoli, and Assemblyman and Chairman of the Committee on Governmental Employees Peter Abbate addressed our members in the convention center, while other political leaders came to the union's pre-lobby day reception at Corning Tower. Our photo essay shows the enthusiasm of our members as they began the day, which featured direct one-on-one lobbying of legislators to advance our political agenda. That agenda includes pension reform, a guarantee that train crews will include an Operator and a Conductor, fairness for our School Bus Members who are subject to discipline, and protections against diesel fumes exposure.